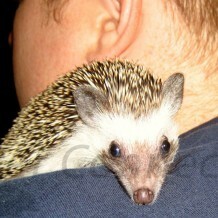 Some hedgehogs do not display outward signs of affection, while others can be quite affectionate toward their owners. They are NOT like cats and dogs, whose personalities shows of affection vary drastically. You may be sadly disappointed with a hedgehog if you are looking for an attention-seeking and affection-giving pet. Your hedgehog may not even greet you or seem happy when you wake it up to take it out of its cage. The average hedgehog is content to do its own thing and may not show any outward sign that it even cares about your existence unless you have a treat in hand. Despite their somewhat solitary nature, they can become very affectionate with their owners and will even enjoying watching TV with you or just snuggling in your lap.